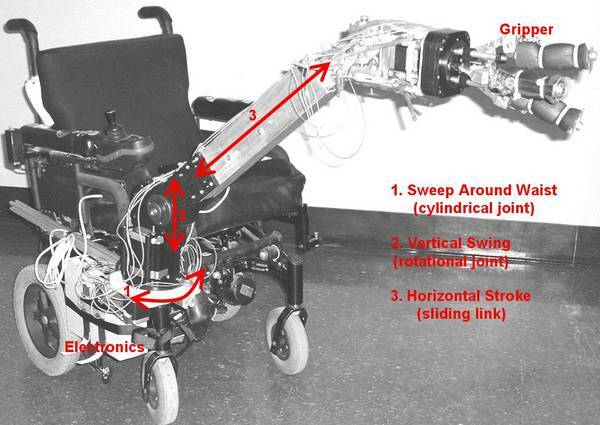 Wheelchair-mounted robot arms are designed with many degrees of freedom to provide users with a general purpose device for manipulating many of the objects necessary for activities of daily living. However, these commercially available systems are quite expensive and are usually not funded by insurance. A low cost robot arm system is developed that will increase a person’s accessibility to indoor spaces by unlatching door knobs and door handles. Implemented is a minimized arm configuration for use with a wheelchair or mobile platform and a gripper design that utilizes only a single motor to turn door knobs and door handles. This proof of concept prototype demonstrates how an arm with many degrees of freedom is not required if we target the expectations for its use. Simulation has shown that the arm configuration can be reduced to three controllable degrees of freedom because the position wheelchair can be leveraged and the two degrees of freedom required to match the gripper with the plane of the door could be passive. Therefore, the arm consists of three motorized joints: a cylindrical joint swinging the arm side to side, a rotational joint swinging at angles up and down, and a sliding link that will extend the arm back and forth to increase its length. This design is otherwise known as a Cartesian robot configuration. 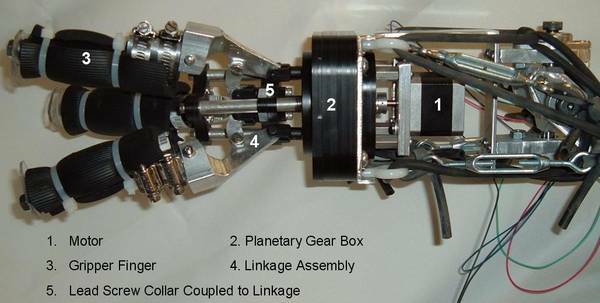 The gripper will use a fourth motor for actuation and it is attached to the arm using a high misalignment spring loaded universal joint. The universal joint will also allow for passive adjustment of the angle on approach and, after the door knob has been unlatched, while the user is pushing or pulling the door open with their chair. The gripper looks like a three-fingered cone placed over the door knob or door handle. The cone rotation is connected to the rotation of the outer ring of a planetary gear set. The sun gear of the planetary gear set is coupled with the lead screw and are both rotating at the same angular velocity. The planet gears reduce the angular velocity for the outer ring gear. A collar is threaded around the lead screw but it is also fastened to a linear slide located along the structure connecting the outer ring gear to the gripper. The difference in angular velocities between the lead screw collar and the gripper structure allow it to move linearly, forward and backwards, on the screw as if the collar were attached to only a linear slide. The fingers then close and spin at the same time: spinning at the same rate as the outer ring gear and opening/closing due to the linear motion of the lead screw linkage. Nubs on the ends of the fingers hold the gripper around the doorknob so a closed gripper does not slip off if pulled. For a door handle, the fingers rotate, and the handle would fall between two fingers and twist while the gripper is spinning. Erin B. Rapacki. MS Thesis: The Design of an Underactuated Wheelchair-Mounted Robotic Arm to Unlatch Door Knobs and Handles. University of Massachusetts Lowell, Lowell, MA. May 2009.